Jose Mourinho has named his starting line-up for Manchester United’s Champions League opener against Young Boys. 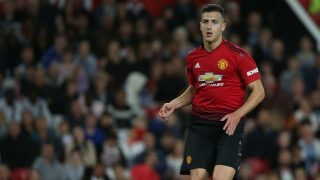 The Portuguese tactician hands Diogo Dalot his first-team debut after two appearances with the club’s Under 23s. He replaces 33-year-old Antonio Valencia at right-back, with the Ecuadorian no longer expected to play two to three games a week. Mourinho has also decided to stick by Chris Smalling and Victor Lindelof at centre-half to try build on some consistency at the back. Paul Pogba is handed the captain’s armband again and is joined by Nemanja Matic and Fred in midfield. The attacking trio will please United’s attacking line-up with pace surrounding frontman Romelu Lukaku. Anthony Martial and Marcus Rashford start on either flank and both are due a top performance. And, what a way to get that opportunity, in the Champions League. Martial hasn’t got the same minutes as Rashford this season, both the attacking duo equally need to make a statement. Lukaku will, hopefully, benefit from their directness and speed on the wings. The full team is listed below.